Making books with children is an immensely rewarding activity. The books I made with my students and son were mostly simple things of joined paper, but were much-loved and read just the same. Recently I discovered the website of a wonderful book-maker, Susan Kapuscinski Gaylord, whose books are works of art. I was delighted when she agreed to sharing some of her ideas with you on The Book Chook. Susan is also generous with sharing her knowledge and resources via her website and blog. The Families page on her website is full of helpful tips, and includes great ideas for making books with children, ideas for book topics and illustrations, tools and materials. There is a page for Teachers with excellent advice. You can also download a free pdf book, Recycled Materials for Making Books, from Susan's Lulu page. 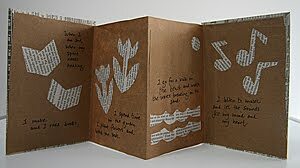 I love the fact that Susan stresses using recycled materials for her books, as you will see in the photographs below. When it comes to the 3 Rs (reduce, recycle, reuse) and newspapers, our house follows the last two but not the first. As subscribers to the New York Times, The Boston Globe, and our local Daily News plus a gift subscription to the weekly Washington Post, I sometimes feel we are personally keeping the newspaper industry afloat. I have been using newspaper in bookmaking for a while, but was inspired to include it as this month's project by a visit to the Paper House in Rockport, MA which was constructed of newspaper in the 1920s and is filled with furniture made from newspapers. The photos here show two accordion books. The top is A Book to Heal the Spirit with pages made from one half of a front panel of a grocery bag and illustrations cut from a newspaper. 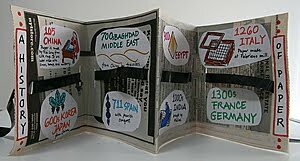 The second book, A Time Line Accordion, was made from a newspaper page (one, not a double spread) folded in half the long way and glued together. I cut slits in the pages and threaded a piece of old videotape through the slits to make the line. Both of these projects are in my new book, Handmade Books for a Healthy Planet. It takes the projects in Multicultural Books To Make And Share and updates them to use recycled materials and reflect a freer approach to making books. There are also written directions with diagrams at Susan's website. Susan Kapuscinski Gaylord is the author of Hands-On History: Middle Ages, Super Pop-up Reports for American History, and Multicultural Books to Make and Share, all from Scholastic Professional Books. She is the founder of makingbooks.com which inspires educators, librarians, and parents to make books with children through web content, ebooks, and youtube tutorials. Since 1990, she has taught bookmaking workshops to over 30,000 students and 5,000 teachers. Thanks Susan! Do take time to explore Susan's website and Making Books with Children blog, and stop by her In Good Spirit blog to check out the beautiful Spirit books.